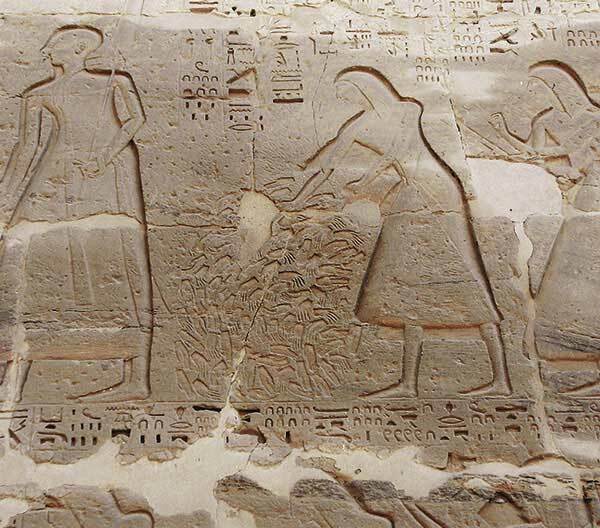 Recent excavations in Egypt have for the first time provided evidence for a gruesome practice previously known only from texts and temple reliefs. Excavations conducted in a Hyksos palace at Tell el-Daba (ancient Avaris) in Egypt have for the first time provided archaeological evidence for a gruesome practice previously known only from texts and temple reliefs, according to an article by the Biblical Archaeology Review. Archaeological investigations led by Manfred Bietak and Irene Forstner-Müller in the northern part of the palace, which in its late phase has been attributed to King Khayan of the 15th Dynasty (c. 1600 B.C. ), have uncovered pits containing altogether 16 severed right hands. A narrative found in the tomb of Ahmose, son of Ibana, at Elkab describes how after each battle against the Hyksos at Avaris and Sharuhen, the soldier presented an enemy hand as a trophy and was given as a reward the “gold of valor.” Among additional evidence from the New Kingdom are representations depicting severed right hands being counted and put into a heap. The finds from Tell el-Daba appear to match the textual and pictorial evidence for the practice of victors chopping off the right hands of their enemies to present to the king as evidence of their success. No such custom is known in northern Canaan, where the Hyksos likely originated. Preliminary conclusions therefore indicate that the practice was native to Egypt and adopted by the Hyksos. The excavations were undertaken by the Austrian Archaeological Institute in Cairo in cooperation with the Institute for Egyptology at the University of Vienna. Tags Biblical Archaeology Review, Cairo, Canaan, Egypt, Egyptology, University of Vienna.